Hello! My name is Maeioum Martínez, I was born this lifetime in Mexico, I speak Spanish and English. I was blessed to have a mother who was into metaphysics so the spiritual dimension of life was part of my vision since I was a child, and it became apparent for me that nature has many clues on how to connect with ourselves, in a way that powerful feelings arises within stirring up a longing oneness and an understanding of life. In my vision the only possible way of living this life is: in harmony within ourselves, with mother nature and with each other, in mutual Respect and Love, and the way to achieve this is to humbly fulfill our purpose allowing and helping others in doing so, realizing the union with source, guided by the Grace of God. This guidance lead my life over so many cultures, where I learned from supportive participation in communal life. I’ve spend long seasons training myself and widening my knowledge in ways to achieve this union with it, I did learned hatha and kabbalah as I spent seasons teaching scuba diving in South America, living and moving for 10 years, I’ve met amazing teachers, who splashed my life with colorful and meaningful examples on natural life, of deep spiritual understanding, and evolutive purpose. From high mountain Brazilian woman priestess to Indian ashram experiences. I consider myself an ADI-shakti mother devotee. As I’ve received teaching from a Buddhist roshi in Japan, a Mother-touched saint in India, and our native Mexican healing arts. Our “ancient unity-celebrating rituals”, had seen me dance to the moon with our wise grandmothers. I’ve been following meditative and healing practices, which are part of my way-of-sharing with the world. I’m a therapist in water and dry massages, and promote woman wisdom in lunar circles and circular dances, and had keep learning ways of support our elders, our pregnant mothers and our children. I’m into realization of our true nature, that’s why it was a blessing for me to become a Hridaya yoga teacher with Sahajananda in Thailand. In Hridaya Yoga I found a powerful set of techniques to step into my Heart, this path has changed me deeply as I learned to live with an Open Heart, expand my inner spaciousness and light up my consciousness in order to reveal my True Nature. That’s why I’ve chosen to share these teachings with you. 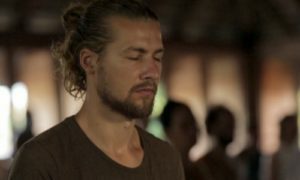 I look forward to guide brothers and sisters to the Space Within, here in this beautiful community in Mazunte, or somewhere else in Mexico, where I give workshops and trainings. Now is always the time, and as present moment happens, To live in the Sacred Space within our hearts is a possibility that await us all and is also our right in this earth. So come and join us to discover it for yourself.